Adkins is the local leader in wastewater engineering services, providing a comprehensive suite of services that support our clients with efficient and sustainable solutions for all wastewater needs. South Suburban Sanitary District (SSSD) pursued improvements in operation efficiency of their aeration treatment ponds with a $77,000 incentive from the Energy Trust of Oregon. SSSD selected Adkins and CH2M Hill to help retrofit the diffuser system in their existing treatment ponds by installing 1,700 feet of aeration piping, and replacing 158 coarse bubble diffusers with 63 fine pore diffusers. This design provided greater oxygen transfer efficiency in treatment of the influent raw sewage and resulted in an overall reduction in blower energy consumption. Adkins assisted SSSD and CH2M Hill with design, construction staking, and construction management services of the aeration system improvements. The resulting project upgrades provided a 33% reduction in energy consumption compared to the previous 9-year average, saving the District approximately $40,000 per year. The City of Chiloquin was issued a Notice of Noncompliance for failing to meet total suspended solids (TSS) concentration limits, and was required to implement corrective measures and improvements. Adkins was selected to evaluate regulatory compliance issues and outline a list of potential improvement alternatives in a Preliminary Engineering Report. Adkins’ report included a comprehensive evaluation of the wastewater treatment and disposal system and identified recommended improvements for measuring influent flows, chlorination and dechlorination of treated wastewater, sludge drying beds, and the standby generator. We assisted the City of Chiloquin with all stages of the wastewater treatment plant upgrade, including funding applications, permitting, planning, design, and construction. The resulting upgrade project was 100% grant funded. 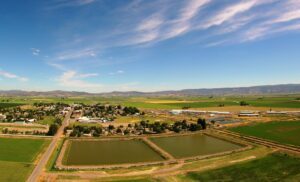 The City of Tulelake selected Adkins to help when faced with disciplinary actions due to being out of compliance with NPDES permit limitations for effluent BOD, pH, and temperature. Adkins designed an economical and environmentally sound solution using wastewater treatment wetlands. A key to success for this project was developing a financial plan and procuring 100% grant funding for the necessary improvements. Phase 1 of this project included the replacement of 3,000 feet of sewer main, the design of one new lift station, and refurbishment of three existing lift stations.